Russ Winger, my husband, is the coolest. We dated for about 7 years before we got engaged, and were engaged for a year before we were married. We’ve been married almost 4.5 years. That’s 12.5 years of relationship, and 10 of them happened when we were both athletes! He retired from throwing the discus (PR 66.04m) after the 2016 Olympic Trials, has lost about 50 pounds so far, and is thrilled to be pursuing other interests. I love doing life with him! We met at NACAC U-23 Championships in 2006, on a developing elite team, but both of us had bigger goals than that level of competition. Russ threw the shotput back then, and continued to do so until I think 2014 (overall PR 21.29m). For multiple years, he doubled at USATF National Championships and made the final in both events. He is a phenomenal athlete and even better person. The highest highs of my career all have something to do with him, including both of us medaling at PanAm Games in 2015 and going to Worlds together in the same year, when I finally cracked a major championship final and got eighth. 2006 NACAC U-23 Championships, Santo Domingo, Dominican Republic. I love my relationship. I am such a huge fan of Russ, and maybe vice-versa. I realize that every relationship is different, but I want to talk about what it’s like to date a fellow athlete! Perhaps you’re wondering, or are having problems that we might have had. I’m gonna go at this from a pros and cons perspective! 1. Shared fitness and health values. You’re both athletes. Regardless of what sport you do, if you have lofty goals and a good understanding that disciplined, smart training and supporting nutrition and recovery practices make you better, hopefully those lessons will translate to the rest of life! For the last approximately five years of his athletic career, Russ was consistently 300 pounds, which is pretty typical for a male thrower. In his first year of retirement, he lost 30 pounds simply by not eating as much as he had during training. In his second year, he has lost an additional 20 with diet and somewhat inconsistent exercise, and has plans to lose more. I love him so much at every weight, because regardless of training, he has always been a super active person. Losing weight just helps him be that person in a happier fashion. I’m a somewhat bigger javelin thrower. I’ve learned through experience that a lean body does not mean far throws for me, so I operate with a little bit more of a cushion while I continue in this career. 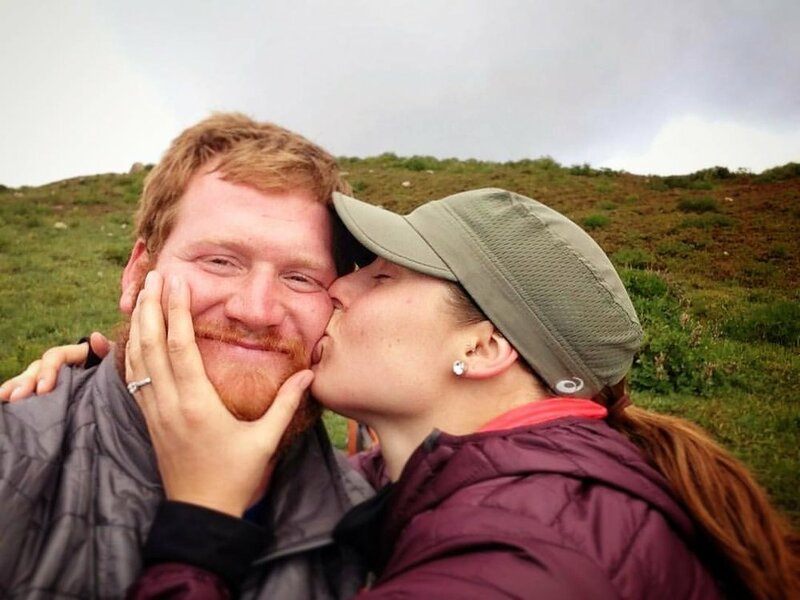 I look forward to the day, though, that meals will be a little smaller, workouts will be a little more outdoor-focused, and weight falls off of me like it has Russ (and I’m confident that it will, because it did when we got married!). Something to keep in mind is that different athletes require different approaches to the “fitness” required for their sport. It can be difficult to adjust to a different lifestyle and stay healthy (eat like a football player but no longer play football, for example), but it’s my hope for every athlete that shifting focus to a more generally healthy lifestyle after sport is possible. Focus on goal-oriented behavior rather than doing things that made you feel good while you were an athlete. Dating an athlete means that hopefully he or she can shift that positive trait of goal-setting to other areas in life. 2. Individualism and the ability to understand each others’ priorities. I grew up with parents who were very much in love and had a great partnership (still do), but were also really independent people within their relationship (still are). My Dad traveled a lot, and my Mom held down the home while also pursuing her own interests and driving me to every sports practice and game. I never thought the amount of time they spent apart was weird, and loved seeing them happy to be reunited. Dating a fellow athlete is a little like that. You care about each other and each other’s outcomes, sure, but you also have your own stuff to worry about. It’s easier not to get offended when your partner focuses on his or her own goals, because you have your own. Having time to be together and focus on that is important, too, but that’s the next section. When Russ and I were both athletes, we could train together, and I absolutely loved that. We never had the same training programs though, even though we had the same coaches over the years, so often we would each drive to the Air Force Academy, perhaps warm up near each other, and then split up to throw. If he got done before me, he would come down and film, and vice-versa. 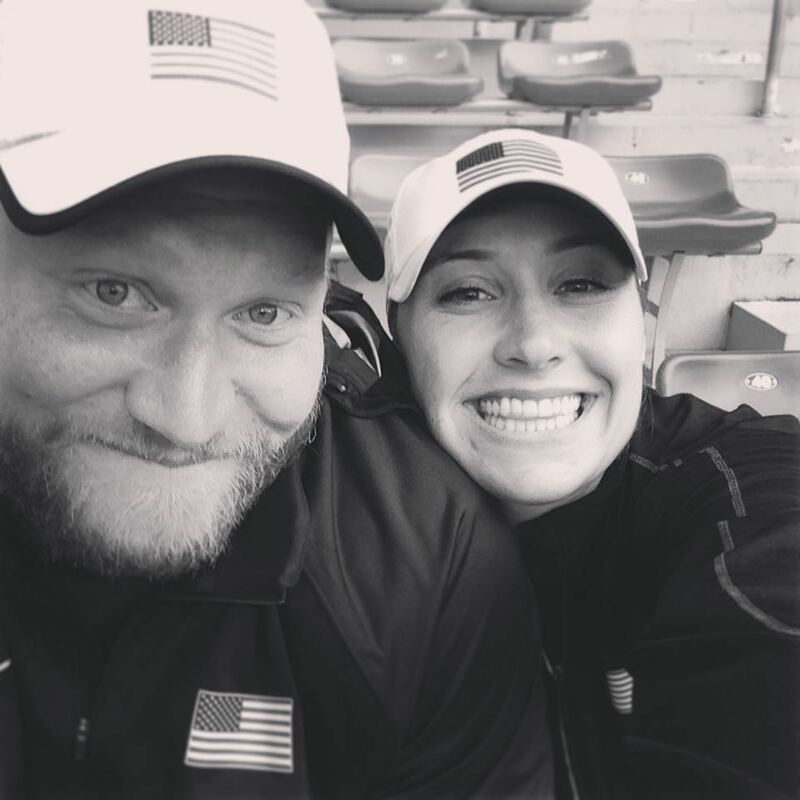 We often lifted near each other at the Olympic Training Center, and were each others’ spotters if needed, but would always be focused on different lifts and different technique, and were probably in different phases of training. We each had different priorities, but could sort of orbit around each other in support. Dating someone who is really good at different stuff than you is cool, too. I’ve said one million times that Russ is twice the athlete I am, and I learned a lot from him in the weight room and on the track. Learning from fellow athletes is fun, and can be even easier when that person is your significant other. Common ground is not only the basis of friendship, like I mentioned in my last blog, but a really great place to start a romantic relationship. As fellow athletes, shared interest is built right in! When Russ first visited me at home in Washington at the end of summer in 2006, we went in search of waterfalls to hike, I caught my first tiny fish on the fly, and we played with my childhood dogs nonstop. Over time, we’ve learned to play bridge with my parents, and now we play with Russ’s grandparents as well. We met through Track and Field, and we continued to have that in common for a long time, but we also very quickly recognized other things that we both enjoy. Again, like I mentioned in my previous blog, if you’ve both chosen to pursue sport, you might have other stuff in common, too. Athletics will fade. It has been so amazing to watch Russ gain momentum in other areas of his life in the past two years. He is truly my leader in that process, and I can only hope to make the transition to regular adulthood as well as he has. Having sport in common is great, but it was merely a starting point for us, and I love how our relationship grew in so many different directions from that. I would hope the same for you. 1. Different approaches to the same thing. Personalities differ. Learning processes aren’t the same across humans. Work ethics run the gamut. Tempers either flare and the wheels come off in moments of frustration, or people buckle down and try harder. It can be beneficial to date someone who thinks differently than you (see the last section). Sometimes, though, those differences can result in conflict. I’ve always been really good at compartmentalizing and doing what my coach tells me to. Russ is more of an independent thinker. Once, in Germany in 2010, we had rented a car to drive to meets, and were going to drive to our last practice before that trip instead of taking the familiar train route we knew. We, of course, got lost on the way, Ty and Mike were waiting for us, and we were both upset with each other for various reasons. I had a great practice once we arrived, which made Russ even more mad at me when we talked about it later. I’m really good at being lazy when I need to be. Rest is important, and I love it so. Russ is an incredibly active person. He gets restless and bored with an entire rest day, and there have been times that I’ve agreed to an adventure and then regretted it because I’m tired. We’ve come a very long way in our ability to clearly communicate our needs to each other, and the joy we experience on those adventures together far outweighs any lingering tiredness I might feel in practice the next day, plus he lets me sleep as much as I want in the car! Dating someone different than you is really fun, you just have to learn how to communicate your approach or needs to that person. The only way to discover those differences is to do life together, too, and realize that it’s not the other person’s fault that you’re wired differently. After that Germany practice, I just had to explain to Russ that throwing in my mind was totally and completely separate from our relationship: I forgot the fight to focus on throwing the javelin, and could then revisit it later. My focus didn’t at all mean that I wasn’t still mad or didn’t care! I just have a weird ability to turn off parts of my brain, and I think Russ learned from me how to do that a bit over the years. In the same way, his questions about technique that used to drive me crazy are now helpful ways for me to objectively watch practice video and not be complacent. It’s difficult to learn how to navigate a different personality, but really worth it to learn something new about the person you love and the different, effective ways to approach sport. 2. Varying levels of success: Navigating the peaks and valleys together. I had a major back injury in 2007, and was in a really bad place right at the beginning of our relationship. Russ moved to Purdue in 2008-2009 to be with me in my fifth year, and was miserable for a lot of reasons (working 3 jobs, training without a coach, and simply being in the Midwest, among others). He had a sports hernia all of the 2010 season (our first in Chula Vista), when I was doing super well. He had surgery to fix it, healed for 2011 and threw big PRs, but then we both struggled through the European season and also never saw each other. I tore my ACL in 2012, but made the Olympic team anyway, and he had done really well all year but missed the team by two spots. I had surgery and then we moved to Colorado. We finally both made the PanAm, NACAC, and World Championships teams in 2015! He did well most of 2016 and then old and new injuries flared right before the Olympic Trials, but came to Rio with me as my coach, as none of my other ones were making the trip. If you’re in the same sport, the direct comparisons of how successful you are can be really difficult to manage in a relationship. I can imagine that different sports might be a little bit easier? If only because learning about the others’ sport would seem more educational than competitive. This is, again, a lesson in communication! Every athlete is competitive, but eventually you learn that constant competition within a relationship is no good. Our friends Rich and Jackie say that when one member of the team is winning, the team is winning. And if it feels like no one is winning, you can climb out of that hole together! It’s okay to voice frustration, and it’s even okay to say out loud that you’re jealous of the other person’s success, as long as you can separate that from your romantic relationship (and SAY that). Russ and I were so lucky to have some incredible track trips together. We spent two weeks enjoying Australia and competing in 2012. We lived in Germany during the 2010 and 2011 seasons together, with friends around as well. The championship season in 2015 was amazing: We went on sushi dates at training camp and were then roommates at World Championships in Beijing. After that we went on vacation in Austria with the Kuehls and I went to Paris with Russ for the Decanation meet. Fantastic memories and experiences that solidified our relationship at each stage, for sure! Our epic 2016 road trip! Dating a fellow athlete is often like a long-distance relationship. Luckily, we have practice in that field, and many people I know do too! Again, communication is key. 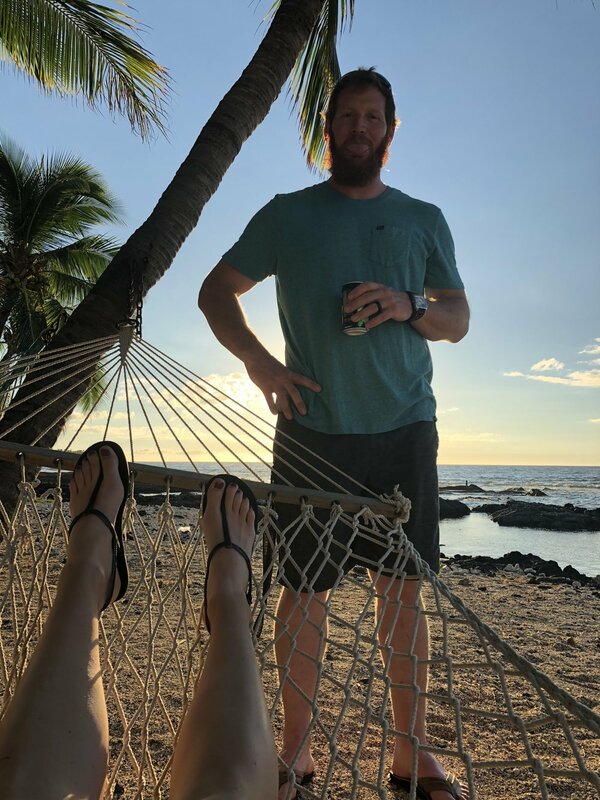 Being willing to shave a day off of the front or back sides of a trip for the sake of your relationship is important, too, and taking advantage of the time that you do have together is key. Sometimes I pick fights before I leave for a trip, but we both know it’s just because I’ll miss him and our home! There are a few things you can do to try and avoid a complainy pattern. A) Set a timer for the complaining. Give it a limit so it doesn’t consume you. B) Always, always have other stuff to do! Take part in your other common interests instead when you feel overloaded by sport. If you don’t have something, start something new together! C) Be really honest. If your partner just doesn’t seem happy and that’s why he or she is constantly unloading on you, let them know that you appreciate their trust in your judgement and the fact that you’re a safe zone, but that you want them to be happy, and it doesn’t seem like they are. On the flip side, if you are the one complaining a lot and it’s weighing you down, do some self-evaluation and see if you need to seek other help (sports psychology) or just do something to change your situation and make it better. I’ll be writing a blog on how to have difficult conversations sometime soon! It can be? But it has never been difficult for me. I really think (and again, I think Russ got better at this over the years as well) that practice is your opportunity to just focus on you, and your relationship is the time you can either talk about it in constructive ways (or a little bit of complaining if you need to), or do other stuff that you enjoy together. My relationship has mostly felt like a refuge from the difficulties I face on the javelin runway, and one of the reasons for that is that I can be completely vulnerable and open about why I’m frustrated and work through it with the person who knows me best if I need to. But mostly I just love doing other things and laughing about other stuff together. I hope that you can find such solace in another human! Go for it if you’re drawn to someone. I’m so incredibly happy with the person I picked, and continue to choose every day. We met through sport and enjoyed it together for a long time, but also like a lot more stuff about each other than the fact that we are athletes! In the same way that you grow and change as an athlete, your relationship grows and changes, and you have to keep programming good stuff to keep it healthy. Finding a partner that is motivated by goals is pretty easy in the athletic realm. Translating that to every day life and a happy partnership is a little bit different, but very worth it to do together!